The software has worked fine before now wont get the connection anymore. I have searched the forum and have seen some people with the same problem .. vor example since using an airport express, so I turned the wifi off and I also forgot and repaired the Mac with the iphone multiply times.. and restarted the the iphone , but still no success the Type 2 Phone software will still tell me .. disconnected or connection failed when I try to connect , reconnect or pair with new device . I don't even know how I reinstall the software since there was no license code that came with the software when I downloaded it. Applications downloaded from the Mac App Store get personalized with a receipt during download. You don't need a license file or code. You can just download a fresh copy from the Purchases tab of the Mac App Store application. To uninstall Type2Phone, move it to the Trash. You may also want to delete preferences. Older versions of Type2Phone stored preferences in the ~/Library/Preferences/com.houdah.MagicKeyboard.plist file. Newer versions of Type2Phone are 'sandboxed'. They own a container folder at ~/Library/Containers/com.houdah.MagicKeyboard. To access the Library folder, hold down the option key as you select Library from the Go menu in the Finder. Trash both the preferences file and the container. 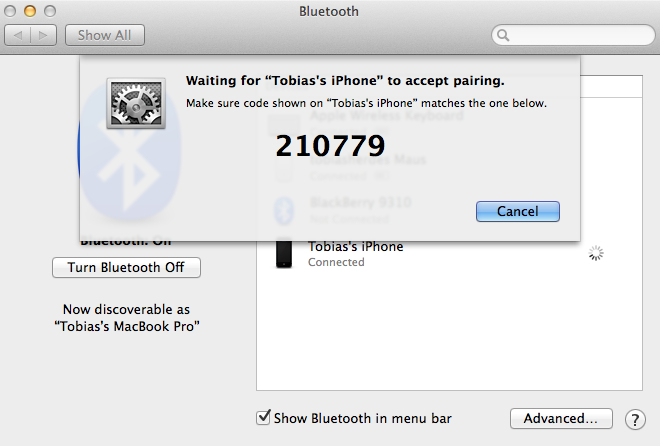 Problems with pairing devices can sometimes be solved by restarting both the Mac and the iPhone. I.e. physically turn it off and back on. This cuts Bluetooth hardware from power and forces it to reset. You may get the "connection failed" message if the previous connection was not closed cleanly. E.g. you walked out of the room with your iPhone while it was still connected to your Mac. The devices may fail to notice that the connection got broken. The iPhone would fail to show the software keyboard, because it believes a hardware keyboard is connected. The Mac would refuse to reconnect to the iPhone, because it believes there already is a connection. These problems can be fixed by turning Bluetooth off and back on. Type2Phone tries to avoid this situation by disconnecting when idle or sent to the background. @houdah sorry after close to 10 attempts I have not been able to get the software working again. I repaired the Mac with the iPhone several times .. and now deleted the software together with all components and reinstalled it.. still same result . Do you get an error message on iPhone when you attempt to pair with your Mac? Does the Mac show any error message? Does Type2Phone show any reaction during the pairing process? Does the software keyboard on iPhone still show? On your Mac, please check /Applications/Utilities/Console.app > All Messages show any error messages? If you suspect WiFi interference, turn off WiFi / AirPort on both your Mac and your iPhone. If that helps, try switching them back on one after the other to see which is causing problems. - the Mac and iPhone pairs fine . There is no error msg. - The software will show the typing on the bottom but still indicate that the iPhone is not connected ( see screeshot) even though in the system preferences of iPhone and mac the connection is shown. - the keyboard on the iPhone will still show when type2phone is running in the front. - will not work with or without wifi.. disabled without available wifi at all ..
Type2Phone should notice (and show) that the phone is connected if you do the pairing procedure while Type2Phone is running or if you initiate a reconnect from within Type2Phone. Are you using any other software that connects Mac and iPhone via Bluetooth? I have a report of a conflict with NotifyR. When you say: The first connection with a new device needs to be initiated from that device while Type2Phone is running. see screeshots .. this can be done when type2phone is running as far in the fron as it can go while pairing in the system .
. still no result !? 1. Type2Phone needs to be running during the pairing procedure. Only then your Mac has the capability to be used as a keyboard. iPhone will record that fact during the pairing procedure. I.e. when you later connect both devices, iPhone will know to expect keyboard input and hide the software keyboard. 2. 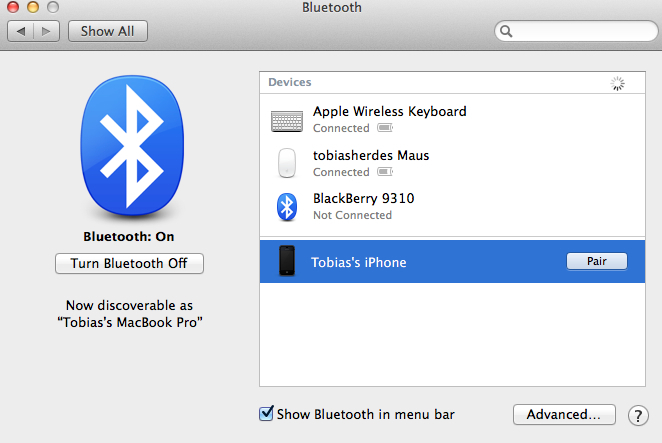 Open Mac OS X System Preferences > Bluetooth. This will make your Mac "discoverable"
Thanka Pierre for bearing with me... was not able to pair from my iphone .. because there war an error which I could only fix by hard reseting ( restoring ) the iphone. After that your lest direction of procedure worked and I can type with my type2phone app again..